Eric in 1995 taking instruction from LaRoy Edwards at Yamaha's Little Red Schoolhouse in California. Eric Nikiforoff, RPT, instructor, at one of the Piano Technicians Guild International Conventions visiting with Lucy Urlacher, RPT an instructor from Missouri. Eric has taught 9 consecutive years at the PTG International Conventions around the U.S.
Eric teaching the tuning method he developed (The 1-2-3 Temperament) to the San Francisco, CA PTG chapter. 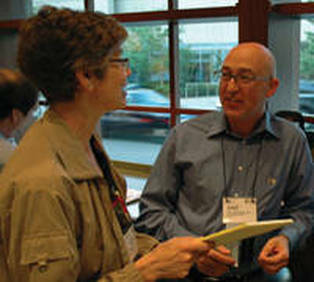 (2010) Eric's method has been taught coast to coast at PTG regional conferences and chapter meetings. His method was featured in the March 2009 Piano Technicians Journal, the official publication of the Piano Technicians Guild. 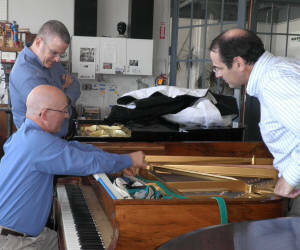 Eric showing two of the San Francisco, CA chapter piano technicians a strip-muting method (2010). Eric's own Mason & Hamlin 1924 model A grand piano which he regulated, put in a new pin block, new strings, new hammers. (For more information regarding regulating, please see the Services page. This slide show takes your through some of the many many steps of rebuilding a grand piano. The slide show below shows the grand piano after it's rebuilt. It's as beautiful to listen to as it is to see! Click icon below to my page.